as per Gregory Clark (The Son Also Rises). Indian Christians merit a separate category (why? they are all Brahmins). 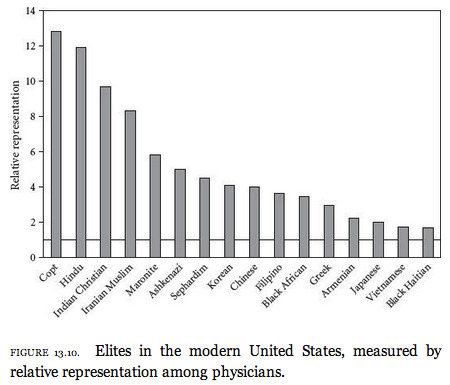 Separate Iranian Muslim category (there must be a large count of Iranian non-muslim physicians). Chinese are surprisingly low down in the ranks. Black African is possibly the most meaningless classification (the author would probably like to single out black non-Americans, but then there is also black Haitian). As far as Indians are concerned it would be of interest to look at data across generations- first generation, second generation,...and so on. indian christians in the USA are often from kerala or south indian more general. it's pretty obvious if you socialize with them. a minority are 1st generation converts like bobby jindal etc. Oh he knows it' indian christians from kerala, if you read some of his older posts you will see he has special antagonism to kerala christians. He gets all worked up if indian christian (especially from kerala) are mentioned in any positive light (he loves to portray them at their worst). Sid why all the hate?.